When you want to know who is touching your genes. Dr. Nate Dorshorst was raised on Dorsland Farms, a 50 cow registered Holstein dairy farm in Junction City, Wisconsin. He grew up working on the family farm where he enjoyed breeding and showing registered Holsteins and riding on calls with his father, also a large animal veterinarian. He attended the University of Wisconsin – Madison receiving his Bachelors of Science in Dairy Science (2002) and his Doctor of Veterinary Medicine (2006). Upon graduation, he was hired by a 20-doctor group practice in Lodi, WI where he founded the advanced reproductive division of the business and gradually transitioned from general large animal practice to becoming specialized in embryo transfer and IVF technology. 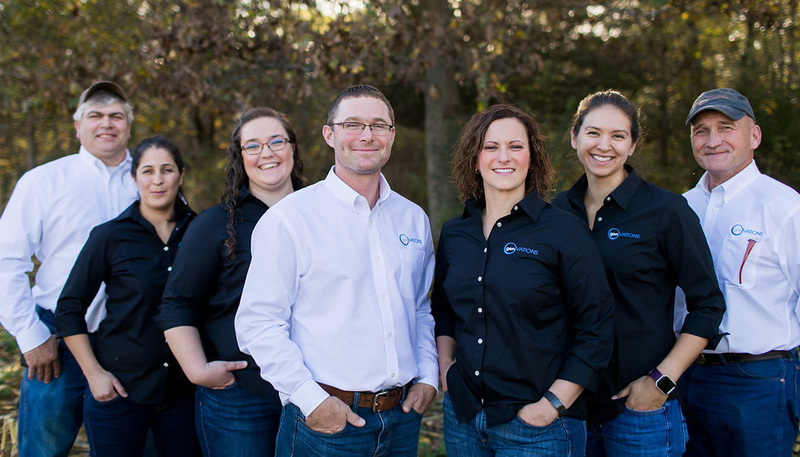 In 2010 he became a partner in the practice and in 2014 the advanced reproduction division was split out to become a separate business entity, GenOvations Inc. Dr. Dorshorst has been performing Ovum Pick Up and In Vitro Fertilization services since 2009 and now operates with 3 donor farms in south central WI. In the fall of 2017 GenOvations opened its own in house commercial IVF laboratory becoming only the 6th privately owned IVF lab in the United States. He is active in the Wisconsin Veterinary Medical Association, where he sits on the Legislative Committee. He is involved in several committees of the American Embryo Transfer Association, including the Education Committee and the Cooperator Committee, which is actively engaged in the development of emerging embryo export markets for US dairy and beef farmers. His other professional memberships include the International Embryo Transfer Society, American Veterinary Medical Association and the American Association of Bovine Practitioners. He lives in Lodi, WI with his wife Melissa and their four boys, Braedon (11) Owen (9) Everett (7) Landon (5) and the family dog, an African Boerboel named Otis. In his spare time, he enjoys spending time with his family, gardening, hiking, hunting and showing registered Holsteins with his boys. Rudi graduated from UW-Madison in 2009 with a degree in Animal Science. Her interest in bovine reproduction began while working in the lab of Dr. Milo Wiltbank, assisting graduate students with projects ranging from OvSynch variations to PCOS research. After graduation she spent some time working on a 3000 head commercial cow/calf operation in Montana before returning to Wisconsin in 2010, when she began working with Dr. Dorshorst. Rudi’s passion for embryology only increases over time. She considers herself fortunate to have had the opportunities she has to develop her embryology knowledge, and is excited to be managing the IVP lab at GenOvations. In her spare time Rudi enjoys cycling, hiking with her dogs, and spending time with her family. Tiffany grew up 25 miles south of Green Bay, WI, on her family’s small farm with Hereford cattle and sheep. She also worked on several dairies and showed Holstein cattle at the local, state, and national levels. She attended Manitowoc Lutheran High School and graduated in 2013. She was a member of successful 4-H dairy and livestock judging teams, including the second place team at World Dairy Expo in 2014. She then attended the University of Wisconsin-Madison, where she was involved in Badger Dairy Club, Saddle and Sirloin, and the Association of Women in Agriculture. She also worked with the 4-H Youth Livestock Extension Program, UW Dairy Cattle Center, ABS Global, and SCR Dairy while attending UW. Tiffany earned her bachelor’s degree in dairy science in May 2017, and she began working at GenOvations right after graduation. When she is not around cows, Tiffany enjoys baking, fishing, hunting, and time with family. Unlock your potential. Contact us today.